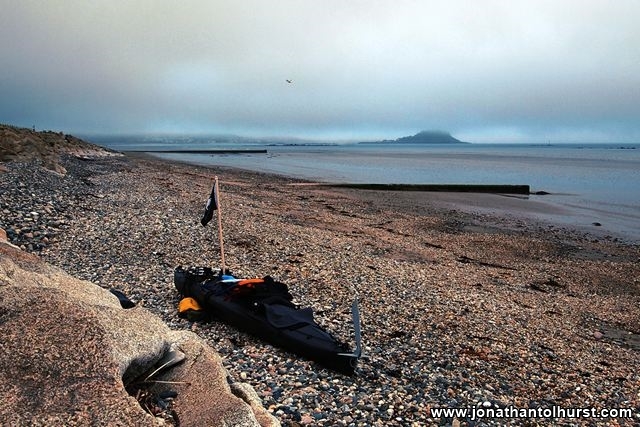 Photographs from my 11 day adventure from Penzance to Charmouth in a Wayland folding kayak. For details of each individual leg of the trip please see the blog posts below. 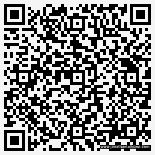 For information on resources used, please see my Penzance to Charmouth kayak trip page. Day 7: After a night of interruptions I headed back to the beach and got myself ready for the dash across Plymouth Sound. 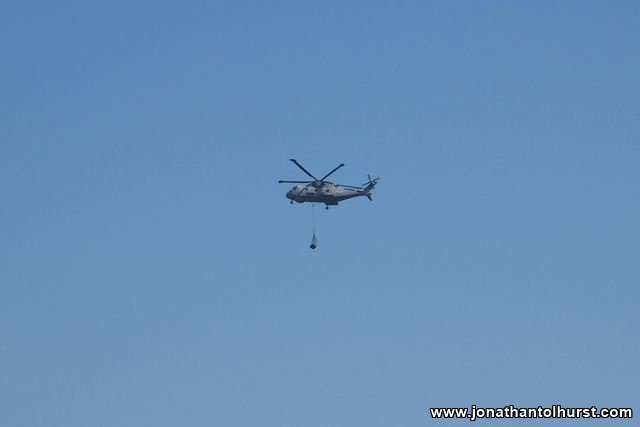 The original plan was to head directly out across to Plymouth Breakwater. HMS Diamond and a challenging head wind now stood in my way, so I opted to creep along the shoreline to Hooe Lake Point before dashing across to the Western end of the breakwater. Several military ships were operating on the leeside of the breakwater and it was only a few minutes before a submarine got underway – thankfully this time was nothing like my 2010 submarine encounter off Pladda Island in Scotland (During my Lands End – Inverness trip I had come within 50 meters of being run down by a nuclear powered submarine travelling at speed on the surface whilst paddling between Ailsa Craig and Arran). 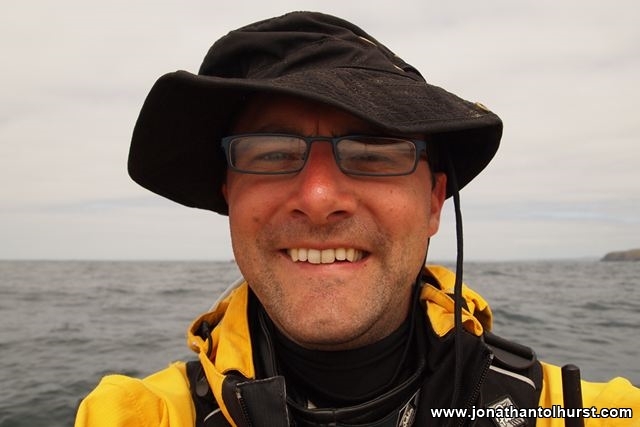 I paddled along the Southern side of the breakwater to the eastern end where I waited patiently as HMS Portland was underway – I wasn’t too sure if the Royal Navy would appreciate seeing my Jolly Roger ensign flying over Plymouth Sound. 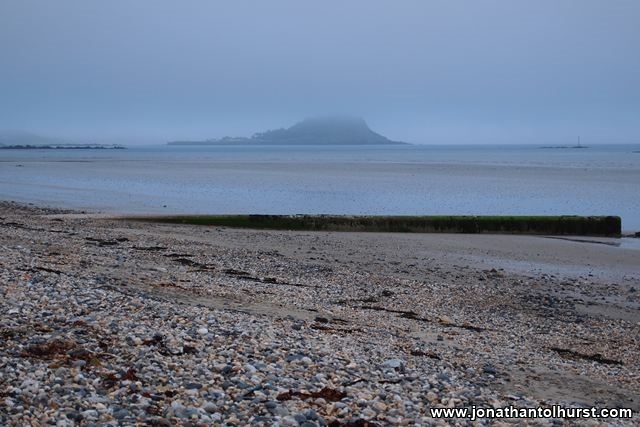 I then sprinted across the channel to Bovisand pier before setting a new course, passing inside the Great Mew Stone. Because of the headwind I decided to hug the coastline where possible, thereby taking advantage of the limited shelter provided by the cliffs. The journey around Bigbury Bay was extremely enjoyable – the coastline is very attractive, as is the mouth or the river Erme. I passed on the outside of Burgh Island (famous for its hotel), before going close inshore at Thurlestone sands to inspect the natural arch in the bay. On arrival at Hope cove I pulled my kayak on to the beautiful beach at Outer Hope. After enjoying some food and a beer at the Hope and Anchor pub I spent some time exploring the area and writing a few postcards. The highlight of the evening was watching a spectacular sunset from the beach – a wonderful finale to an awesome day. Day 6: I awoke a little later than previous mornings having had a nice comfortable bed to sleep in. After checking that my kayak was still in order I returned to the hotel to enjoy a full English breakfast and a chat with some of the other residents. 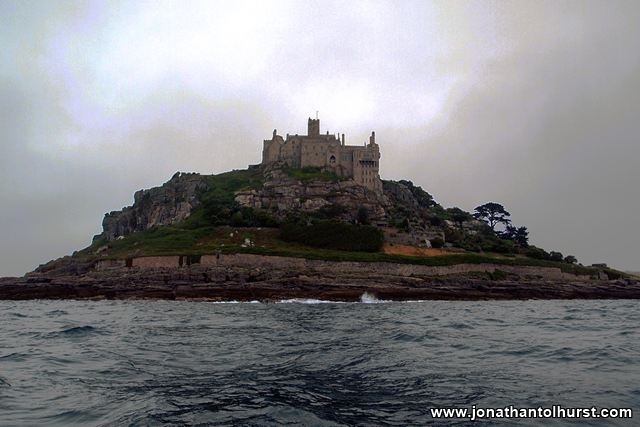 After checking out, I set an Easterly course along the coast towards Rame Head which took me past Looe Island. The range at Tregantle was in use so I made sure that I was far enough out to sea so as to avoid the “danger area”, although I could still hear the shooting at 2NM out to sea. 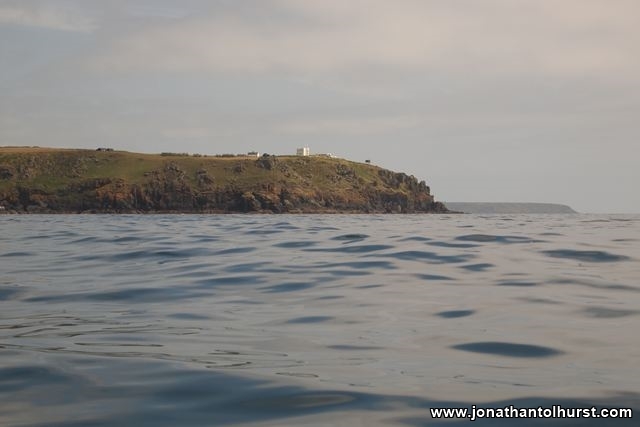 After several hours of paddling I rounded Rame Head before heading towards Penlee Point. Between the two headlands I encountered a welcome area of relatively rough water which was to be expected, given the state of the tide and wind. From Penlee Point I headed into Cawsand Bay and landed on Cawsand Beach. After completing the necessary paperwork to leave my kayak on Cawsand Beach I had an interesting chat with a fellow sea kayaker who had paddled around Great Britain way back in 1972. I spent the late afternoon relaxing on the beach watching the various types of pleasure, commercial and military craft moving in and out of Plymouth Sound. Later on in the evening HMS Diamond, one of the Royal Navy’s new type 45 destroyers anchored in Cawsand Bay. I spent the night in a nearby woodland where I was rudely awakened firstly by a group of noisy drunken teenagers (who had no idea I was there) and then by a group of large unknown animals who swiftly ran off after I made several growl-like noises to frighten them away. Thankfully, there were no further interruptions for the remainder of the night. Day 5: Waiting for the tide to turn at Gorran Haven gave me a chance to enjoy a full English breakfast and catch up with the harbour master before heading out to the Gwineas rocks. 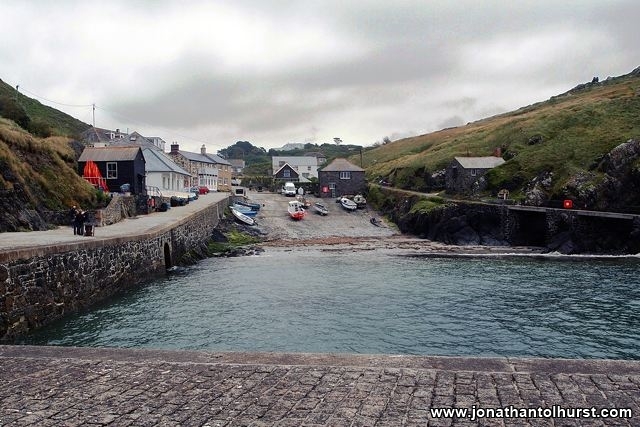 I then set a ENE course for the small harbour at Polperro. If I had had time I would have liked to explore St Austell Bay but instead took the direct route across to Polperro which took me several NM offshore – a thoroughly enjoyable paddle. 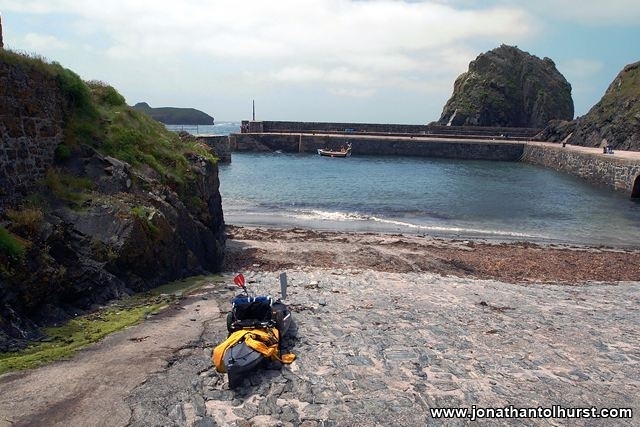 On reaching Polperro, I landed the kayak on to the beach just outside the harbour entrance and pulled my vessel far enough into the conveniently located smugglers cave so that she would be well above the high water mark. Because the beach was covered for three hours each side of high tide the boat would be safe from any interference during this time. 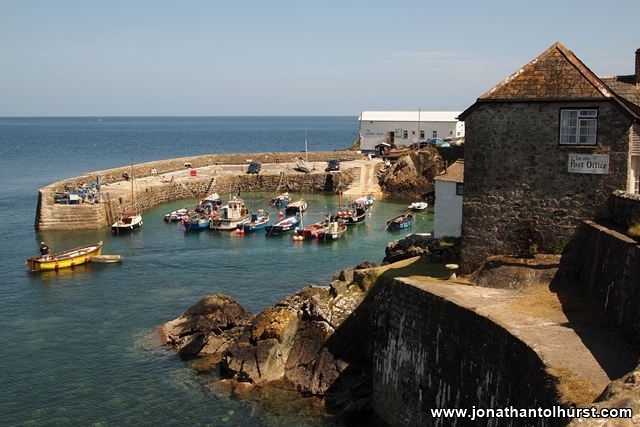 I really enjoyed exploring the narrow streets of Polperro, even more so once I had managed to wash out the sun spray that I had accidently sprayed into my left eye during the crossing from Gorran Haven. This meant checking into a hotel for the first and only time on the trip, which also gave me a chance to recharge my phone and camera batteries. After visiting the Polperro museum to learn about the area’s rich smuggling history, I visited a few taverns including the “Blue Peter” and the “Ship Inn” where I enjoyed some real ale and live Jazz. In the evening I treated myself to a steak at Nelson’s restaurant after yet another fantastic day. I set off from Coverack at 6am, first heading for Lowland Point and then on to the Manacles – a group of rocks that have seen more than their fair share of shipwrecks over the centuries. 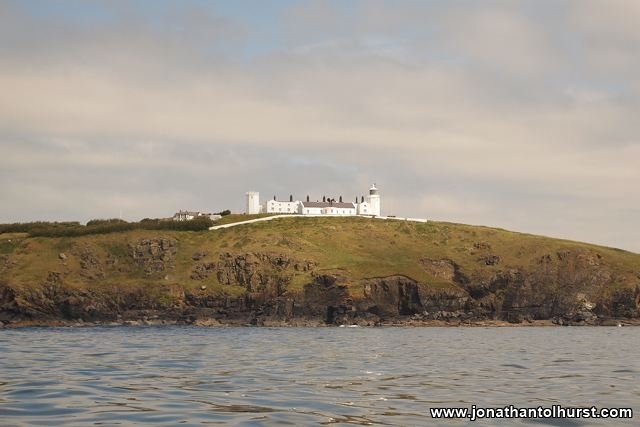 On reaching the Manacles I set a NE course straight out across Famouth Bay for Dodman Point. 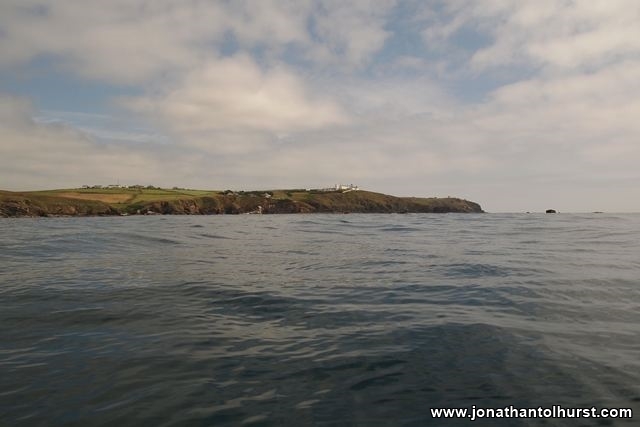 The sea state was smooth as I paddled across the front of Carrick Roads. It took several hours to reach Dodman Point on which there is a large stone cross. About half way through the journey I desperately needed to pass urine, so quickly had to fashion a makeshift urinal using a plastic bottle. 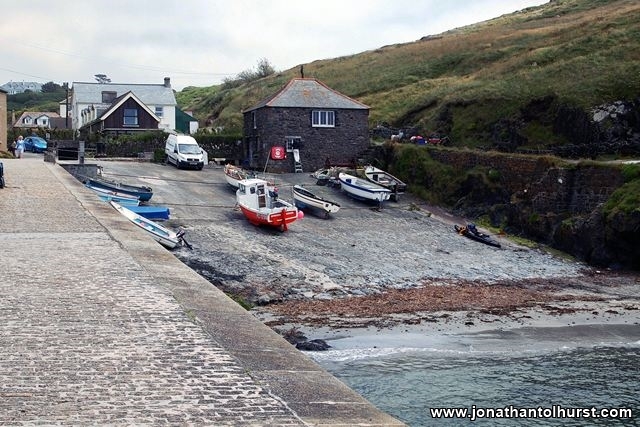 From Dodman Point I followed the coast line around Pen-a-maen Point and into Gorran Haven which is a charming mix between working harbour and tourist beach. I tried without luck to contact the harbour master before heading into the village for some lunch. I spent the evening looking out over the Gwineas rocks after a wonderful day out on the water. 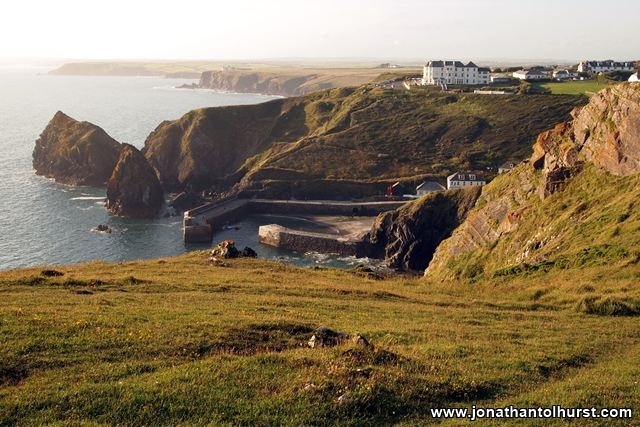 Day 3: After spending a beautiful night up on the headland above Mullion Cove, I headed down to the harbour in preparation for the next leg of my trip which would take me around Lizard Point – notorious for its challenging seas and shipwrecks. 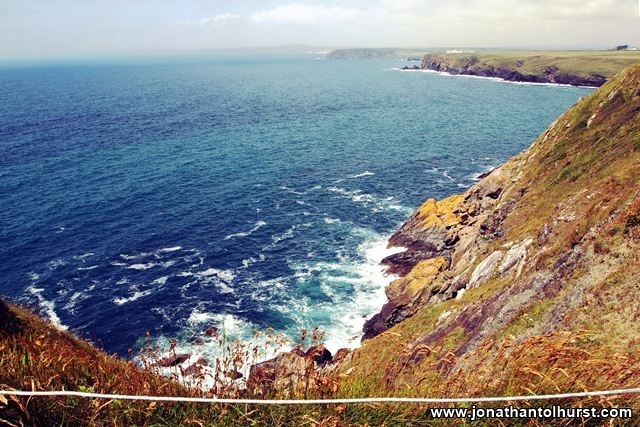 My plan was to reach the Lizard at slack water, then go out wide into the race and away from the danger of the rocks. I launched into Mullion Harbour at around 11am and made my way through the inside passage between Mullion Island and the mainland. On leaving the lee of the island the ground swell was noticeable, so I kept a comfortable distance away from the cliffs which are truly spectacular along this section of coastline (as is the noise of the waves smashing against them). On reaching Rill Point, I looked right for any signs of the Boa race which forms off shore. As planned, I reached the Lizard at slack water, making sure that I stayed at least 0.5NM South of the outermost charted rock. The race was barely perceptible in the conditions. 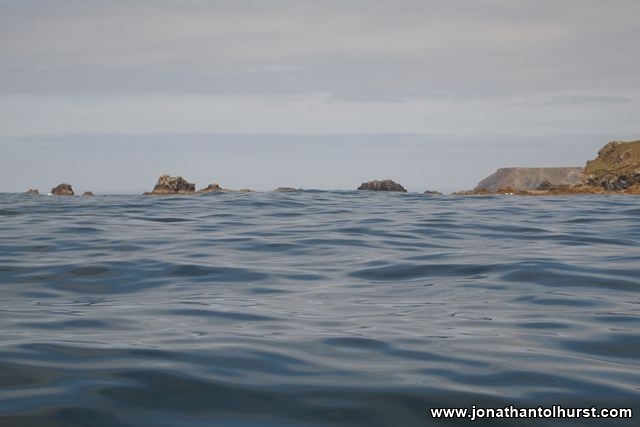 Once I had made it around to the Eastern side of the Lizard the groundswell disappeared completely. Continuing East, I passed under Bass point where there sits a lookout station and the famous Llloyd’s Signal House. 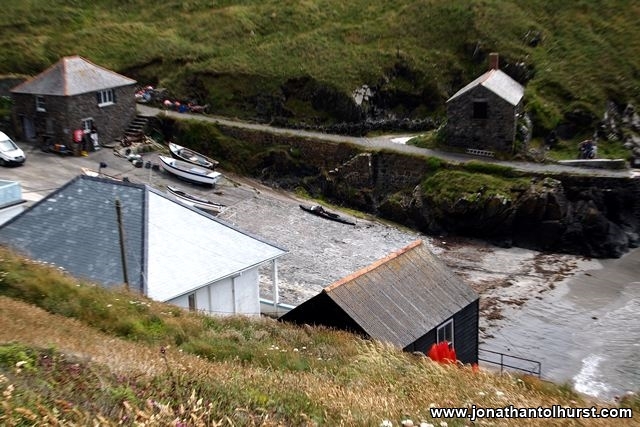 Further around I could see the Kilcobben Lifeboat Station which replaced the original at Polpear Cove. I continued onwards past Black Head, Chynhalls Point and finally Dollar Point before landing inside the tiny harbour at Coverack. A well earned pint awaited in the Paris Hotel followed by fish and chips from the Old Lifeboat Station. The remainder of the afternoon was spent studying the history of the old Coverack lifeboat. Day 2: Awaking early, I packed up quickly and began to prepare to get underway. There was a slight wave on the beach which I quickly broke through before setting a course for St Michael’s Mount, which was ESE across Penzance Bay. The wind and groundswell slowly built as I paddled across the bay. On reaching the Mount, I had a good look around before making a SE course for Mullion Cove some further distance down the coast. 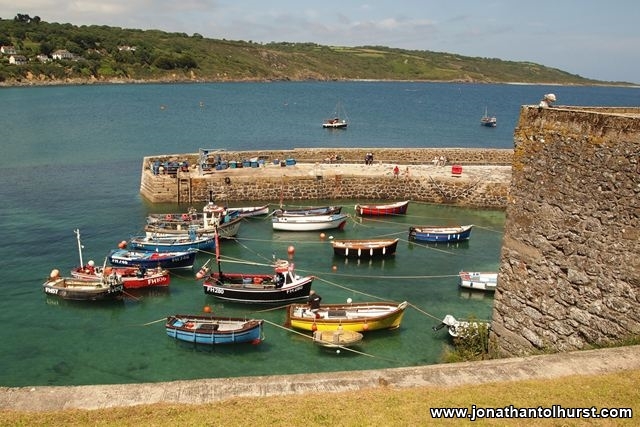 I soon passed Porthleven and its harbour’s entrance, before looking for any visible signs of “The Loe” which is now permanently hidden behind Porthleven Sands. The groundswell continued to build as I moved further down the coast which is more exposed to the Atlantic Ocean. There were several rather rough patches where waves broke over the bow of my vessel. 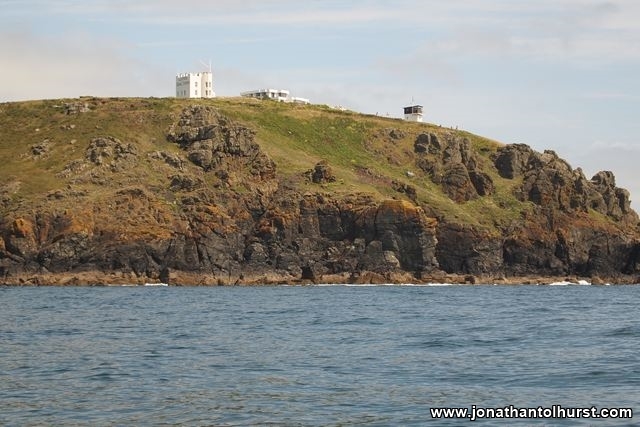 After several hours I finally reached Mullion harbour which is snugly tucked in behind the shelter of Mullion Island. 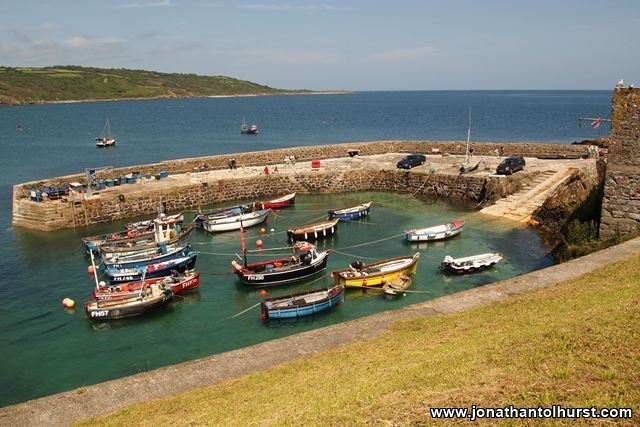 The harbour is run and owned by the National Trust who have spent a considerable amount of money over the last decade making annual repairs to the harbour walls which take a lashing during winter storms. On arrival, I headed to the Cafe for a cooked breakfast (the Cafe is also the place to find the harbour master) before heading out to explore the surrounding cliffs. 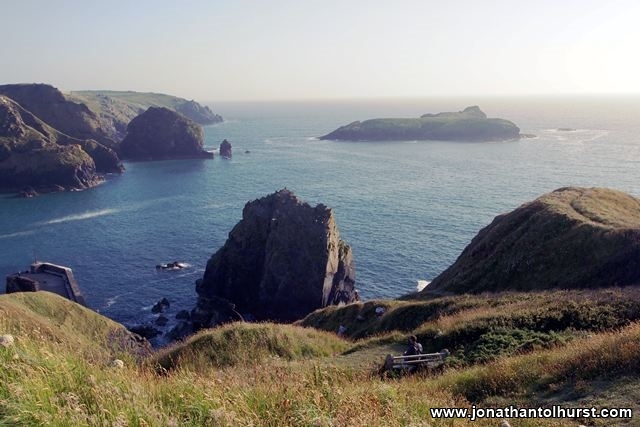 To the South, Mullion Cliff is part of the Lizard National Nature Reserve and affords excellent views out over Mullion Island. 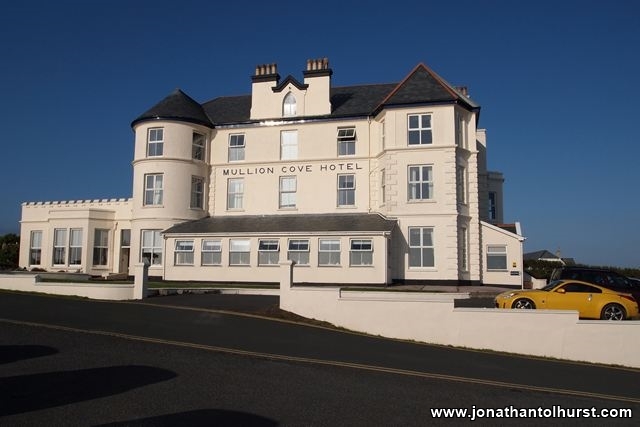 To the North is Mullion Hotel where I enjoyed a beer and an evening meal, thankfully avoiding the attention of an infamous aggressive seagull. The journey from Penzance to Mullion Cove and exploring the Mullion area was a thoroughly enjoyable start to my kayaking adventure. Day 1: For my main holiday in 2013 I decided to kayak along the south coast of England in my Wayland folding kayak. After several months of planning, the day finally arose to get the kayak down to my start line in Penzance. My luggage for the trip included the folding kayak and trolley, a dry bag containing my swag, and a waterproof rucksack containing the rest of my gear. From leaving home in South Norwood I took a pre-commuter slow train into London Bridge. I didn’t fancy trying to take the folding kayak all the way across London during rush hour, so at London Bridge I hailed a black cab to take me to Paddington Station where my gear was loaded into the Penzance train’s guard’s carriage. The journey from London took over five hours. From the station at Penzance I wheeled my kayak to the seafront where I carefully assembled the craft. I checked over the assembled vessel several times – this was the first time that I had assembled the rudder so wanted to make sure that I had got this working perfectly. After a quick trip to the shops to pick up some provisions and tea I called it a night. The kayaking would begin in the morning. Awoke at 4am. 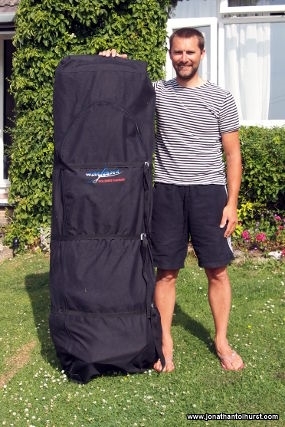 Packed up sleeping system before jumping in the kayak and heading out of Newquay harbour towards Trevose Head. Seas confused with a relatively impressive groundswell. Watched in awe as the sun rose above the mainland whilst the sea birds danced a few centimetres above the waves. Three hours passed before I reached Trevose head where I picked up the tidal race which through me around the head to Mother Ivey’s bay. I landed through very light dumping waves. 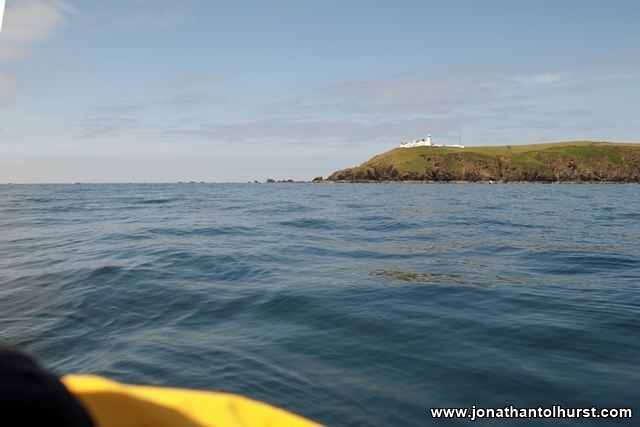 Slept on the beach for a few hours before returning to the water where I pointed the boat towards Pentire point. The race was confused around this headland (no surprise there). 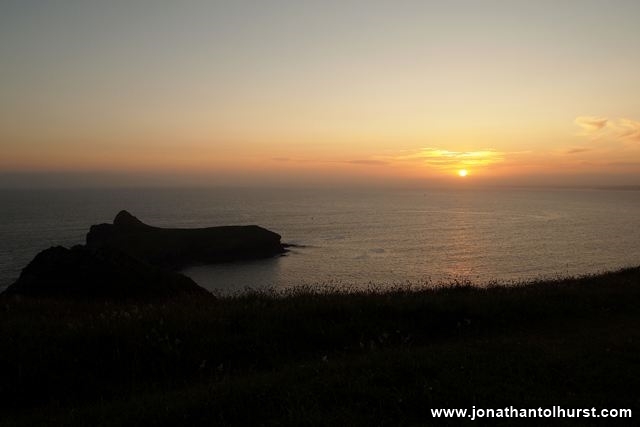 I continued on towards Tintagel head and then along the cliffs to Boscastle. When I reached Boswell I was unable to locate the harbour entrance so I spoke to the coastguard on the radio who guided me in through the obscured entrance. I booked in for the night at the YHA. Tomorrow there is a strong wind warning so have decided on a rest day tomorrow. The weather looks to be a problem for the next few days. Awoke early on my birthday to the sound of large waves close by – surf conditions had arrived during the night! Packing up quickly I set off making a successful passage through the surf break on first attempt. I caught the tidal stream around to Portreath where I landed on the most sheltered spot on the beach. Body boarders were out in force making the most of the excellent surf conditions. Mulled around on the beach gobbling up a tasty cheeseburger before catching the tidal stream again in the afternoon which would take me around the coast towards Newquay. En route I passed Porthtowan and then confused conditions around St Agnes Head. Onward I paddled across Perran bay then past several surf beaches (which I didn’t fancy trying to land on). 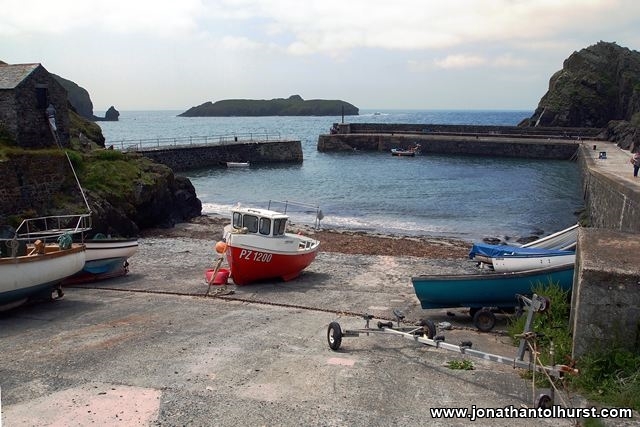 I finally rounded Towan head and into the welcomingly calm waters of Newquay harbour. I celebrated my birthday with a steak and bottle of Corona at a harbourside restaurant.